Strategically placing recycling containers provides as a reminder to reduce, reuse and recycle. 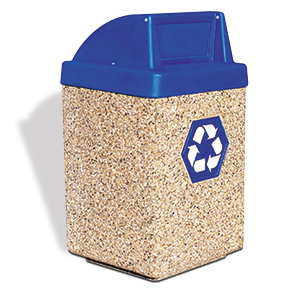 This solid concrete recycler prominently displays the highly recognizable recycling logo helping promote participation in your recycling program. The push-door lid securely fits the concrete unit, preventing the accumulation of unwanted pests and precipitants all while concealing its contents and suppressing undesirable odors. The heavy-weight concrete construction reinforced with steel rebar offers unwavering stability, durability and longevity even in extreme weather conditions.